Capsule Summary: Charles tries to defend Klinger at his court martial while Hawkeye and B.J. 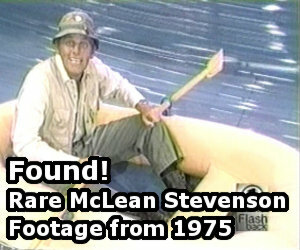 hope to find the real thief and clear Klinger’s name. Like the first part, “Snappier Judgement” has just one storyline — Klinger’s court martial — with related plot points involving every character. For much of the episode the action is split between those taking part in the actual court martial and those left behind at the 4077th. Charles volunteering to defend Klinger at the court martial is classic Charles and it is understandable that Klinger would agree. How can you argue with someone who has the word “win” in their last name? Seeing Charles try his hand at lawyering could have been amusing. Instead, Charles turns into a buffoon and it’s anything but funny. It’s embarrassing to watch and I have to wonder how David Ogden Stiers felt about those scenes. Margaret’s performance during the mock trial in Klinger’s office is likewise embarrassing. Her laughter is actually disturbing, likely the result of some sort of mental breakdown rather than a reaction to the “testimony” Charles had written for her. Her laughter is also more than a little insulting to Klinger. Hawkeye and B.J.’s plan to offer up an expensive tape recorder as bait for the real thief makes a certain amount of sense. The way they went about it, however, is absurd. Shouting about it in the at the mess tent, in the showers, and at Rosie’s Bar? Really? How did they know that the thief was even someone at the 4077th? They didn’t realize that all of the thefts took place during surgery until after the court martial was underway. Nobody noticed a huge and growing pile of explosives behind the mess tent? Nobody thought that was unusual or out of place? How were Hawkeye and B.J. able to set up the phony surgery that flushed out the thief? Did they call ahead? For some reason the first scene of the episode, right after the recap ends, is very grainy for approximately 57 seconds before abruptly clearing up. Having watched this double last week I was surprised at just how such an interesting idea could turn out so… dreary. Everything looks perfect as a synopsis; new gadget, rash of thefts, Klinger wrongly accused, court martial, Charles biting off more than he can chew and a last minute acquittal. Where did it all fall down? I think some of the problem is the leaps in logic. Klinger coming back from the black market with the camera could have been covered by all the 4077 officers vouching for him, and the deus ex machina of figuring out the thefts all took place during surgery, then setting up a fake surgery session, just grates. A good idea, court martial episodes always give a lot of opportunity for humour, drama, and poking fun at bureaucracy, but so thinly handled and with such a reliance on luck, coincidence and huge plot gaps it falls flat. Completely agree with your review. Very silly two-parter, and one of the many signs that the series was running out of gas by this point. this episode along with the first part shows that the series was running out of steam by this point. The courtroom scene was hilarious as Charles is quickly shown to be out of his league. But, that is as far as the good news goes. The final set up to catch the crook is forced and as phony as a three-dollar bill. Was Klinger ever offered REAL legal counsel, or did Charles just assume the role? I can’t imagine him going to an army trial without decent representation. Charles offered to represent Klinger which was Klinger’s near-undoing. I also want to know what the crooked MP had to gain from railroading Klinger in the first place. I agree that Charles made the case more about his reputation than Klinger’s innocence. Certainly not up to the standard of the Novocaine Mutiny or Henry Blake’s trial; there are so many plot holes nothing short of a complete rewrite could salvage this mess. I think Klinger was just a convenient target, or maybe the MP knew enough about Klinger’s shady past to think it would be easy to get him convicted. 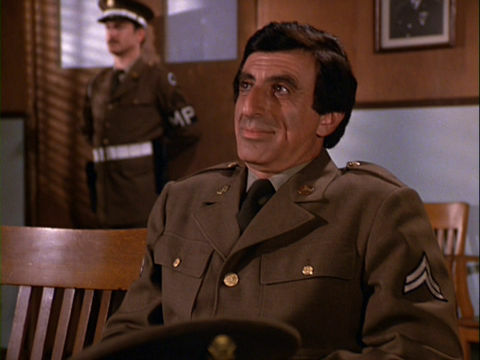 Potter at least should have had the knowledge and wisdom to not allow Winchester to represent Klinger, who would have been given an actual legal counsel by the Army at any rate.